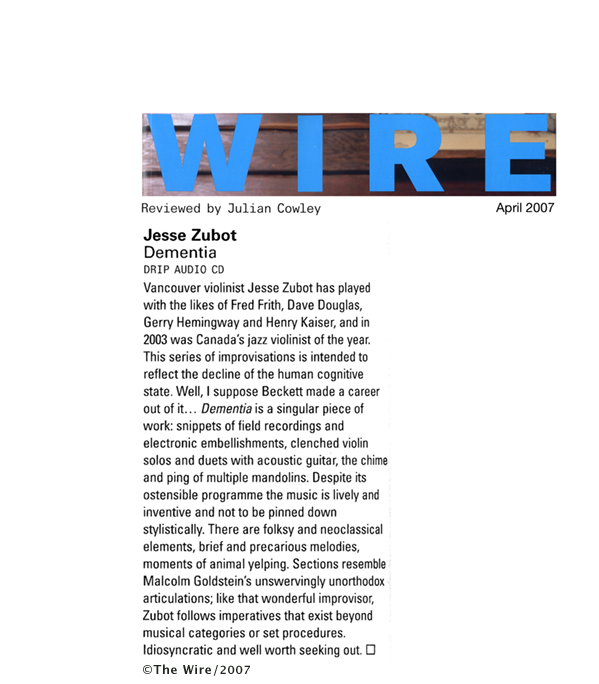 Dementia is Jesse Zubot's first album entirely made up of improvisations. It pivots between solo improvised violin, micro-mandolin orchestras and minimal electronic-influenced sound design. 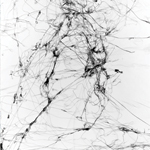 This music was documented during a condensed period of contemplation (June 2006) and is meant to reflect the decline of a human's cognitive state. The urge to go back and edit problematic musical events was purposely avoided in order to capture moments of confusion, paranoia, hope, agitation and the momentum of passed time. Jesse Zubot, of Vancouver, B.C., is a founding member of the acoustic roots group 'Zubot & Dawson'. Their last recording was produced by Lee Townsend (Bill Frisell, Charlie Hunter) and released on True North Records in Canada. Zubot is also a member of the Great Uncles of the Revolution which includes well-known Toronto bassist Andrew Downing and jazz trumpeter Kevin Turcotte. Both groups are Juno Award winners (2002-03). In the past few years, Jesse has delved heavily into the world of improvised & creative music working with artists as diverse as Fred Frith, François Houle, Secret Mommy, Peggy Lee, Dylan van der Schyff, Fond Of Tigers, Eugene Chadbourne, Dave Douglas, Joe Fonda, Nels Cline, Tony Wilson, Evan Parker, Tony Wilson, David Tronzo, Humcrush, Ron Samworth, Gerry Hemingway, Henry Kaiser and countless others. In 2005, Jesse released two albums entitled LaConnor and Zubotta on his new Drip Audio label. LaConnor, a disordered electro-acoustic album, ended up on many year end best-of lists including Exclaim! Magazine's Top Ten Experimental/Avant-Garde albums. Zubotta, spent a lot of time on !Earshot's Electronic music chart and received airplay on programs such as CBC Radio 3. Jesse spends a lot of his time performing live with these various projects and has appeared at some of the worlds more prestigious festivals including the Monterey Jazz Festival, Era Jazzu (Poland), The Montreal International Jazz Festival, The New York Guitar Festival, Dobrofest (Trnava, Slovakia), Mulhouse Jazz Festival (France) & The Guelph Jazz Festival. In 2003 Jesse was named Violinist of the Year at Canada's National Jazz Awards (2003). "...sweetly nostalgic and achingly wounded...this is beautiful music." - Exclaim!